NGC 2359 is an emission nebula surrounding a Wolf-Rayet star 11960 light years distant. The exposure was cut a little short for this object by some guiding issues that took some time to sort out that caused the stars to trail in RA. 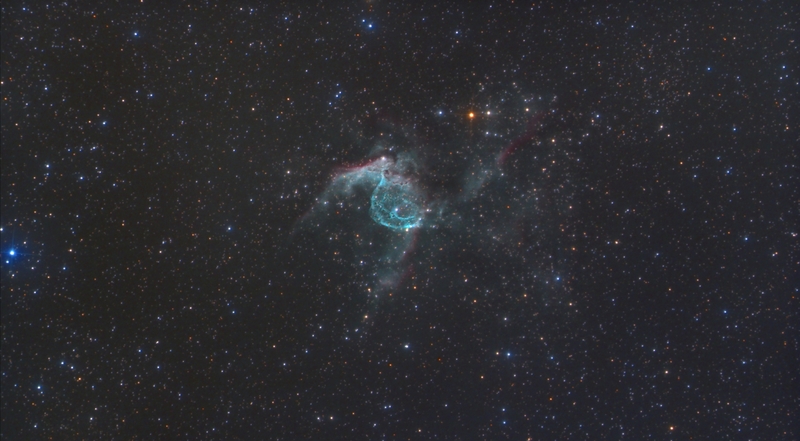 More details about the image capture are available on my imaging blog. For an interesting comparison check out IC 132 in my image of M33. It is another emission nebula with a rather similar shape. My best previous attempt on this object can be seen here. It wasn't a great shot, but it did show that I could capture it from my location. Processing Calibration and stacking done in Images Plus. No darks were used in the calibration as my 60Da has built in dark suppression. Masked stretching was used to keep the stars small on the initial arcsinH stretch. Feature mask used to split out the stars and the nebula layer was stretched with multiple iterations of masked curves. LMS processing (see my processing tips page) was used to increase the contrast of the nebula layer. Masked additive colour balance was used to boost the red in the nebula image. The star layer was colour enhances and then recombined with the nebula layer. Masked RL deconvolution was used to sharpen the recombined image and the final image was binned for web supply.